RAVENSCOURT APOTHECARY PERFUME OIL. - CRUELTY-FREE BECKY. BRAND Ravenscourt Apothecary. UK based brand, UK made products. VEGAN This product is, but some of their products contain UK sourced beeswax. They state that this is because they don't want to import synthetic wax from Mexico to keep their carbon footprint to a minimum, but are looking to go completely vegan in the near future. INGREDIENTS Paraben-free, alcohol-free, phthalate-free. In fact, the ingredients list is very short and consists of: an earl grey tea infusion; fractionated coconut oil; and blended essential oils. Short & sweet. 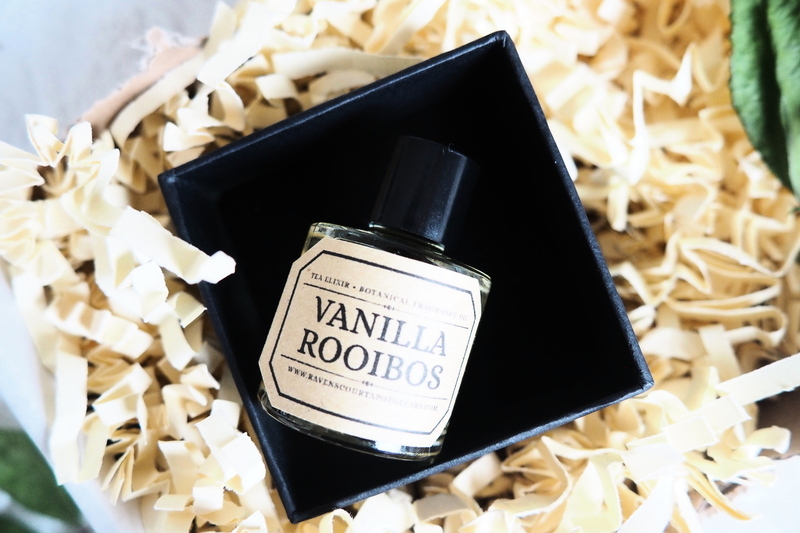 PACKAGING The perfume comes in a little glass jar sat snuggly inside a cardboard box with a beautiful design and wax stamp. Delivery wasn't crazy speedy, but not ridiculously long either. PRICE £30. Yeah, I know, not cheap. But you only need a little amount so I'm guessing (hoping) this will last a long while. The samples certainly stretched pretty far. SCENT A wonderful spicy vanilla. The brand describe it as rich, sweet & spicy and I definitely agree. Think vanilla, cardamom, cinnamon. I guess you'd classify it as a night-time or winter scent, but I'll be wearing it all year round for sure. LASTING POWER I would say around 5-8 hours depending on where on the body it is placed and the amount used. Because it's oil based, the scent seems to stick to the skin really well. PROS Everything! I love the ingredients list, the packaging and the brand owner seems really sweet. Plus the scent is unlike anything I've ever smelled in a perfume and honestly is my go-to at the moment. I like scents such as Prada Candy Perfume & Jo Malone Blue Agave & Cacao Cologne (neither are cruelty-free, but just for reference of mainstream scents I've enjoyed in the past). CONS I think the only con I can think of is slightly irrelevant as it's the fact that you can't spray the perfume (because it's in oil form). This is not really a con, just a fact about the product I guess. I guess you could say that the price is a con as it's quite expensive for 30ml, but you get what you pay for. Truth is, it's a pretty banging perfume oil! Highly recommend if you're into the scents described.